This review is going to be big. The Fogpen is an all in one device, but not the all-in-one device meaning it has all its components and battery attached and inseparable; that’s another kind of all-in-one vaporizer. Where to begin? Starting off with how it comes packaged, the Fogpen is quite a small package for all the things it vaporizes. There are similar devices that let you switch between herbs, waxes, and e-juices, (we’ll get to the comparisons later) but something about the Fogpen’s utilization of space inside its box was remarkable. But even that list doesn’t explain everything. Some pieces double as other things, like the extra concentrate coil that also acts as a cover for the mouthpiece or the mouthpiece that serves as a cover for the dry herb attachments. As I said, this is going to be big. I’m just going to give up. As much as I despise the “pen-look,” vapers seem to like them, and manufacturers keep making them, (you know, give the people what they want), so I’m not going to rag so much on the design of the Fogpen. The Fogpen is somewhat of an overwhelming device, in the sense that there is so much to it that just unboxing it seemed like a daunting task. Notwithstanding, since the Fogpen does first appear as a pen, I was impressed with its attractiveness. I ordered the kit in stainless steel, (there is also an all-black version) and I was surprised at how well put together the entire kit was. The Fogpen comes ready with the concentrate attachment already installed. Just like a fountain pen, the top cover simply comes off when you pull it upward, which then reveals the ceramic concentrate chamber, the fog chamber and the mouthpiece. Pulling up the top level reveals the bounty the Fogpen comes with. Since we’ve already gone through what’s inside, my first thoughts on how everything was packaged was similar to watching a parade of clowns coming out of a small car – I just asked myself, how did they get everything in there? Myster thought of everything to include with this device. The package is balanced and not over-stuffed with things you don’t need. Myster did a good job of utilizing all the space it had within the box and yet not making it seem overcrowded. Alright, enough with the packaging. 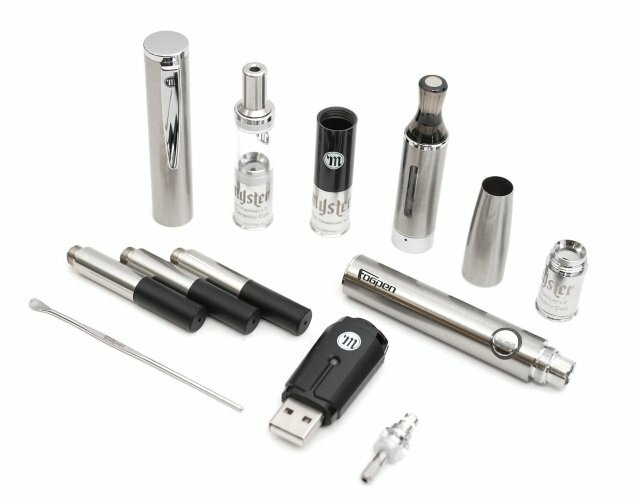 Let’s move on to how the Fogpen performs, how easy (or not) it is to use, and how it transitions from a concentrate to a dry herb to an e-juice vape pen. Since the Fogpen comes with the concentrate chamber already attached, I went ahead and tried the Fogpen’s capacity to vape concentrates. Like I said the top cover comes off just it would with a classic fountain pen, and made the rest of the device somewhat accessible. Using the dab tool provided by Myster, I smeared some dab around the edges of the chamber. I didn’t put it around the entire chamber because I wanted to leave at least one side open for better airflow. The atomizer inside the Fogpen has only one coil, which is a wicked coil, but the added attachment is dual quartz coil with a ceramic chamber. Once the chamber was filled to my liking, I pressed the large firing button five times to turn it on, which lit up the circular, blue indicator light and then pressed the trigger to heat up the device. After about three to four seconds, the vapor entered the fog chamber like a white python summoned by a snake charmer’s flute. It was beautiful. Keeping my finger on the button produced more and more vapor, but that was me just seeing how much vapor I could produce. The draw was loose and required the barest amount of effort. With all that vapor buildup inside the chamber, the taste and flavor were fully formed and hit all the notes I was expecting. The Fogpen comes with three separate loose-leaf/dry herb/plants (or whatever you want to call them) cartridges that can be pre-filled before you head out, so you don’t have to be messing with the packing and grinding of a new cartridge whenever you’re out. You just put in a new cartridge, and you’re done. Amazing! Myster knows vapers; this is a problem I always have with my dry herb vape pens. Once I’ve already vaporized whatever I packed into my chamber, I need to find a quiet (preferably discrete) place to pack another bowl, and that becomes a whole mess in and of itself. With pre-filled cartridges, that is no longer a problem. The cartridges were easy enough to fill. You unscrew the black tube and pack in whatever you want into the lower chamber. You screw on the blacktop, and you’re set. For added discretion, Myster has also included a white chamber cover, so you can even go further down low. The white chamber cover also acts, as an adapter, should you want to introduce your Fogpen into a 14mm water stem, for water pipe vaping. Again, Myster thought of everything. The dry herb cartridges don’t last forever though. The recommended usage time is around 5-10 sessions, but I went to at least 15 sessions with one of my cartridges. Inside, the cartridges feature a single ceramic coil with titanium wiring, so it heats up quickly and powerfully. I also noticed the top cover of the tube has a little spring-loaded disc that packs in your material when you screw it back onto the lower half, which I thought was ingenious. As for the vapor and flavor production, I was impressed. Holding down the firing button for a few seconds, and then taking a haul was the best way to get started. And then as the device got hotter and hotter, you just hold on for as long as you wanted to get a perfect rip. The e-liquid attachment to the Fogpen attaches like any other vape pen atomizer. The coil inside is a wicked coil, so you want to let your e-juice soak into the wick for about five minutes before you start using it. The tank was easy enough to fill up. It was a glass chamber, and by tilting it sideways, it was easier to get the e-juice into the tank. But you have to make sure to remember to keep the tank upside down and screw in the battery from the top, or you’ll have a big mess on your hands. Keep screwing the battery in, until it’s tight. After letting the e-juice soak in for a few minutes, I started to heat up the Fogpen and was impressed with the flavor and cloud production. The e-liquid chamber has a glass mouthpiece, so I could see a little of the vapor starting to snake its way out. The e-liquid attachment has a replacement coil, along with the one already inside the attachment. So, all told, there are at least seven (7!) different coils in the same package. The last 3-in-1 device I reviewed that comes to mind is the QuickDraw DLX. I remember the “temperature control” settings that were managed by the different pins on each cartridge that, when it hit the battery, controlled how hot the device got, depending on what it was vaporizing. Great! I liked the QuickDraw; it performed well, but the Fogpen wins, I think mostly because of its boldness. Now, how exactly do you quantify “boldness”? Myster took a great leap forward, if you will, to create a device that was powerful, versatile and great-looking. You could argue that Myster overstuffed their package with all these bells and whistles, and that’s a legitimate argument. But if all these bells and whistles help the device perform better and do serve some function instead of just being a gimmick, then I have to give the decisive victory to the Fogpen. “Versatility” is the word to go with here. I mean, seven different coils, for all manner of materials – dry herbs, concentrates, and e-juice. But there are also the other attachments, like the fog chamber and the water pipe attachment that add even more possibilities to the Fogpen’s repertoire. Switching between vape materials in the same device has always been a tricky proposition for manufacturers. There have been some noble attempts, but something always lacks. 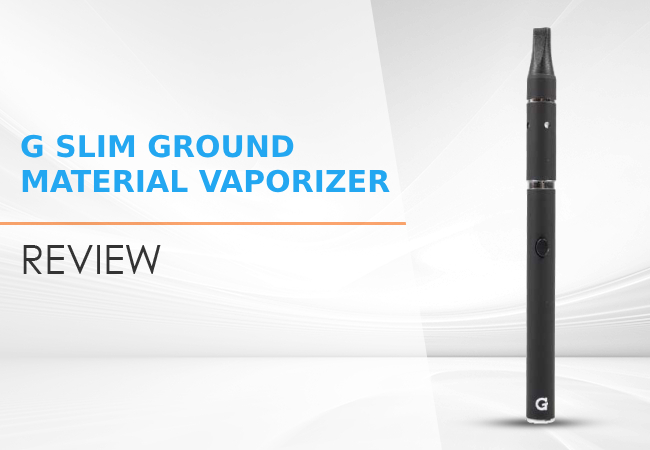 The device performs well as a dry herb vape but lacks the power to tackle e-liquids well. There’s a myriad of other problems that can happen. But with the Fogpen there are none (at least, not that I have seen yet). I mean with a device like this, you give yourself a lot of work trying to solve all the potential design flaws and other things that could go wrong. But the design team did a good job, given that in each of its iterations, the Fogpen produced strong, flavorful vapor. Only the dry herb cartridges can be pre-filled, although you could also carry around the extra concentrate coil as well, e-liquid would be a problem, I think. 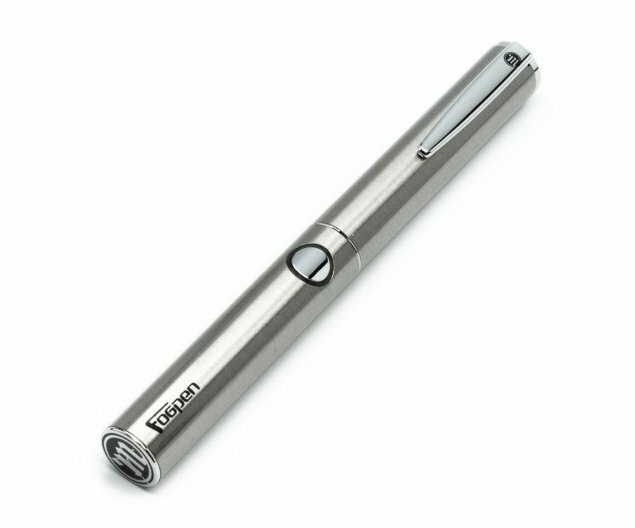 The Fogpen’s vape design (to look like a regular fountain pen) was something that I could easily overlook with a device that does as much and performs as well as the Fogpen. 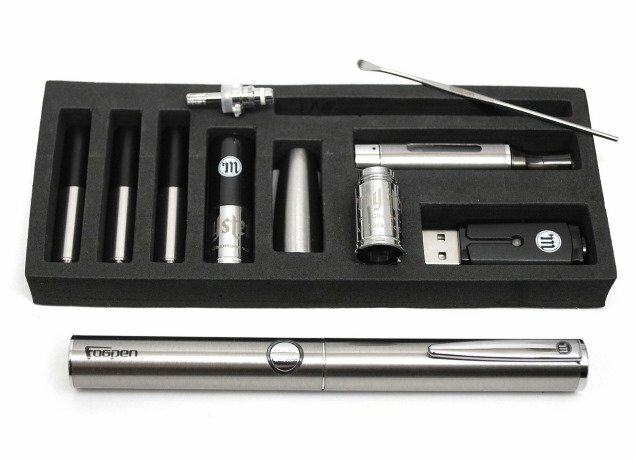 And, it is probably only in the case of the Fogpen, where the tacky pen design lent some points to the device since it is easy to hide away or use discretely, especially with all the covers and tops included in the kit. As much as I’ve tried, I haven’t been able to find how many milliamps the battery has or how many volts is outputs. I would have liked to know what exactly goes into the Fogpen to make it perform so well. But apart from the fact that the battery has 510 threading and is interchangeable with different cartridges, I don’t know that much else about the Fogpen. But, it’s not a deal-breaker. I will never doubt another “pen” mod again. My doubts and complaints about designers lacking inspiration on how to design pen mods have finally been put to rest by the Fogpen. Even the name sounds good. Of course! A pen that writes fog! How else could you categorize a vape pen!? The Fogpen looks great; it’s easy enough to use after playing around with the different attachments; it performs incredibly well; the pre-filled cartridges work well enough, and the fog chamber lets you witness an amazing show, just before you inhale. The battery has a lifetime warranty so you could theoretically get a new one should anything happen to it. It is also interchangeable with any other type of cartridge that has 510 threading. And, what else is there to say really? The “high-end” that Myster includes in the product title is appropriate since the Fogpen does reach for the top. I give the Fogpen High-End Kit a well-deserved 10/10. Evol Vape introduces the Stealth Kit that features upgrades like three different temperature levels and pass-thru charging. Read our review here.